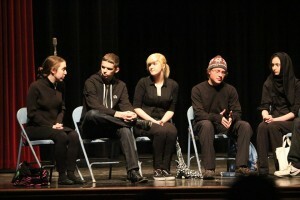 Last Saturday, Feb. 8, thousands of people gathered at Waterloo West High School to watch the state speech competition. There were 103 different teams there competing to have the chance to compete at All-State on Feb. 22. “Speech competitions are crazy,” head coach Alissa Unertl said. A speech group performs at the speech showcase at CFHS. Cedar Falls High School had 21 groups competing at the the district competition. In order for a group to get to State, it must get a Division I rating at Districts. Sixteen groups got a Division I rating at Districts and got the chance to perform at State, where they would try to qualify for All-State. At State, 10 groups got a Division I rating. At speech competitions, even if students get a Division I rating, which is the best one can get, students are not guaranteed to go to All-State. None of the teams from Cedar Falls qualified to participate in the All-State competition at Iowa State University. The speech team is coached by art teacher Alissa Unertl. This year is Unertl’s first year as the head coach for Cedar Falls. “I love seeing the growth in students from the first practice to when they perform at contest. Sometimes students don’t realize how much better they have become, but since I watch them from day one, I’m witness to it. The confidence they gain and the smiles on their faces when they are done with a performance make it worth it,” Unertl said.